Edwin Wood became one of the first Master Plumbers in Detroit in the early 1900s. 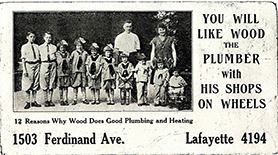 In 1908, he began what would later inspire his son Dan to open Dan Wood Plumbing, Heating, Cooling, & Electrical. Ed included his son Dan in his paper titled “12 Reasons Why Wood Does Good Plumbing and Heating”. Dan (the 10th of 12 children) learned, under the apprenticeship of his father, the skills of the trade and the importance of providing professional, knowledgeable, and honest service to the homeowners and businesses in Metro Detroit. After his father retired, Dan Wood furthered his knowledge and experience completing a Union Apprenticeship. He worked in the service field for Bruce Wigle Plumbing for many years. With 6 kids to feed, Dan thought he would try it on his own. He started working out of his house in Southwest Detroit in 1957. His successful service company grew and eventually he opened his first brick and mortar storefront on Vernor Highway in Detroit. Dan spent 27 years servicing the neighborhood, a success which was due mainly to proficiency of trade and trustworthiness shown to the customer. His son, Alan Wood, began his apprenticeship under his father in 1974, working summers in Detroit. 10 years later, Dan expanded to the Novi area, opening up a second storefront on Grand River. 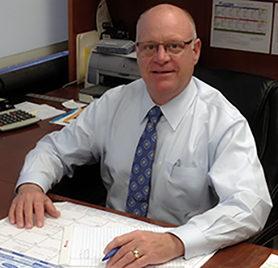 His son Alan continued to operate the Detroit branch while Dan worked to grow the new location. In 1997, Dan and his wife, Helen, retired from the plumbing business, selling both branches to his son Alan and his wife, Denise. In 2006, with times changing and the growth of the neighborhoods in the western suburbs, Alan closed the Detroit branch. The original storefront in Novi also moved down the street to a new and larger facility to accommodate the growth the little neighborhood business has achieved. Today, the company employs over 35 employees, 22 vehicles, and has attended thousands of customers in and around the neighborhood.